The 31st of October 2016 was a dark day for the world of iGaming. The gaming developer Actual Gaming announced to the online casinos running its software that it was going out of business. Temporarily? Definitively? Why? How? We don’t know yet but one thing is sure, the developer has left the online casinos using gaming tables live from the Fitzwilliam Casino, Penthouse Casino and Expo Casino in the lurch. More on this announcement that has hit the gaming world like a bombshell. The way the announcement was made out of the blue to the online casinos that had worked with it for many years, shows a real lack of professionalism. How can roulette, baccarat and blackjack tables just be withdrawn from one day to the next leaving several online casinos hanging? Nobody knows the reasons behind this sudden departure. Luckily enough, solid casinos like Dublinbet and Lucky31 Casino which use Actual Gaming’s technology also have even better software. These live casinos realised that it’s best to run several types of software not to find themselves in trouble. Offering several types of software means that not only do players have access to a wide variety of live tables but the casino can continue even if one developer does a runner like Actual Gaming has done. The live online roulette, blackjack and baccarat tables from Irish casinos the Fitzwilliam Casino, Penthouse Casino and Expo Casino are no longer available. 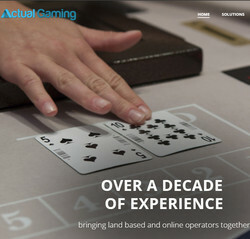 Actual Gaming built its reputation on the fact that one could play in real Irish land based casinos. Two other developers are rubbing their hands together at the sudden departure of Actual Gaming: Evolution Gaming and Extreme Live Gaming. Evolution Gaming’s online roulette table, Dragonara Casino is a table situated in the Dragonara Casino. Dragonara Casino is the leading casino on the island of Malta. With HD images and multiple views, Dragonara Casino’s technology is ahead of Actual Gaming’s. You can find it in leading casinos such as Dublinbet and Casino Extra. Extreme Live Gaming’s online roulette is based in the Admiral Casino in Gibraltar and is available to online players. To see what it’s like we would encourage you to drop into Parklane Casino where you can play at an actual online roulette table in a real casino. However, baccarat and blackjack fans will have to play at tables in studios. Actual Gaming’s sudden departure has been a shock for the whole profession. How can a developer just leave online gaming operators high and dry after so many years of collaboration?